Lace tank dress for your Sims 3 females. 2 recolorable layers, 4 color variations included, custom mesh, custom thumbnails. Skinny leather pants for females. 2 recolorable areas, 3 color variations, custom CAS and launcher thumbnails. 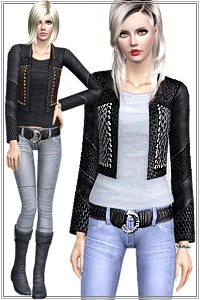 Leather jacket with studs, new custom mesh, base game compatible, 3 color variations, 4 recolorable areas, custom cas and launcher thumbnails. Bolero sweater, 3 recolorable areas, 3 color variations with stripes, custom cas and launcher thumbnails, base game compatible. 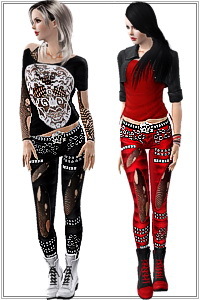 Studded leather pants with a skull belt for your chic Goth, Rock, Punk... Sims. 4 recolorable areas, 3 color variations, base game compatible. Gothic lace skull top, 3 recolorable areas, 3 color variations, custom cas and launcher thumbnails, base game compatible. Denim romper for females. 3 recolorable areas, 3 color variations, custom CAS and launcher thumbnails, base game compatible. Long Sleeve Striped Color Block Dress. 4 recolorable zones, 3 color variations, custom thumbnails, custom mesh, base game compatible.